Fresh, cold Vermont sap dripping from a Sugar Maple tree. This year, it felt like winter would never end…temperatures remained in the teens and single digits all through February and most of March; the time when we normally make the majority of our maple syrup crop for the whole year! Finally, on March 12th conditions were right for the first sap run – a hard frost at night and temperatures warming into the upper 40s and low 50s that day. 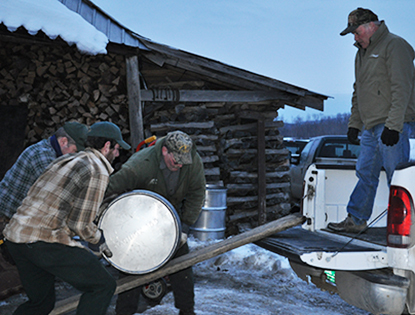 The following morning, we rushed right up to Fairfield Vermont eager to pick up the first of the new 2015 crop maple syrup from the Howrigan Farm, one of Dakin Farm’s select sugaring operations. Within hours we had the syrup back at Dakin Farm, heated, filtered and packed in containers to line our shelves and ship nationwide. On the Howrigan Farm, collecting sap and pouring into 5 gallon bukets for transfer. Sam Cutting, Sr. selected the Howrigan Family Farm 45 years ago for their unmatched quality. After the first sap run, it only warmed up enough for the sap to flow intermittently for the rest of the month. There were four more sap runs in March and the icy cold sap they produced boiled down into some extraordinarily flavorful maple syrup. This is the syrup we offer you now. Later in March, we hosted our annually delicious and topped with fun pancake breakfasts and Sugar on Snow parties held on March 16, 17, 23 & 24. Then came Easter and all the maple-cured, cob-smoked hams we prepare and provide to folks locally and across the country. 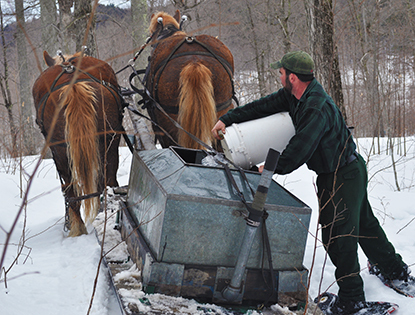 Pouring sap into a holding tank on a horse-drawn sled for transfer to the Sugar House for boiling. After Easter, we were eager for sugaring to settle in with freezing nights and warm sunny days; the perfect conditions to thaw our maple trees right to their roots and allow the sap to flow. These conditions did prevail for most of the first full week of April. At Dakin Farm and at the family farms we purchase bulk maple syrup from, everyone was busy collecting sap and boiling it down into maple syrup. However, it is pretty late in the season now and the long range forecast calls for warmer weather both night and day. 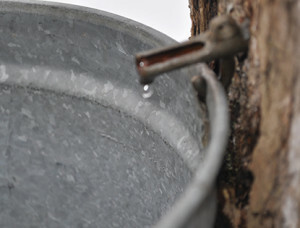 In maple country, everyone is fearful that the freezing nights we need to create the pressure in the trees for the sap to flow are few and far between. With warmer weather, the buds will soon form on the trees and the 2015 maple season will be over. Sam Cutting, Jr. and the team loading a barrel of fresh maple syrup into a truck for transfer to Dakin Farm. How much syrup was made in Vermont during this short season when the perfect conditions did prevail? It is too early to tell. Will there be more freezing nights up in the rugged hills of Vermont were the majority of the maple syrup is made? We sure hope so. In any event, we remain confident that Dakin Farm will be able to secure enough maple syrup from our select sugar makers to handle the annual demand. We know the flavor is excellent and we look forward to bringing in the crop, storing it in our cool, underground root cellar and packing it fresh each week in retail containers to sell in our two Vermont retail stores and ship to our loyal customers nationwide, as we have done for more than two generations.